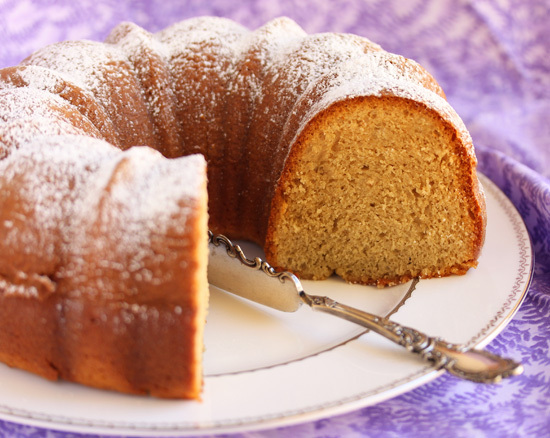 The recipe for this cake was given to me by my father-in-law, Grandpa Cyril and it is one that I treasure. Cy passed away several years ago just before Thanksgiving and we all think about him during the holidays now. This guy loved to cook and he put on a Thanksgiving feast every year for the 25 years I knew him, which sometimes included this cake. So this year I decided to make it in his honor for our Christmas celebration. This cake is easy, with only five ingredients, one of which is a cup of Tawny Port wine. Yes, it is definitely boozy. And the smell is so divine. Pair it with some coffee ice cream and you are transported to heaven. Thank you, Grandpa Cyril. 1. Preheat oven to 350 degrees F. Place oven rack in center position. 2. Grease and flour a 9” tube or bundt pan. 3. Mix all ingredients in large bowl and beat with a fork or spoon for 5 minutes. 4. Pour batter into pan and tap on hard surface to surface the bubbles. 5. Bake for 40 to 45 minutes until tester comes out clean. Cool upright on rack. 6. When cool, set serving platter on cake pan and turn over. Give the cake a rap and it will fall out onto serving platter. Sift powdered sugar over cake just before serving. Thank you for having the recipe for the Port Wine Bundt Cake available on your website. I want to make this for Christmas. My Mom used to make this, the exact same way. I’m sure she gave me the recipe, but darned if I can find it. She’s in Assisted Living now, and her copy of the recipe is probably around somewhere, but it was so much easier finding it on your site, than any of our homes!